Today's the day...I select my winner of the Taste of the Browns tickets! Thank you to everyone that entered. Random.org selected #28-- Erin. Congratulations. I don't have your contact information, so make sure that you email me by Monday to claim your two tickets, or I will select another winner. If you didn't win, there are still other blog giveaways happening. Check out Clue Into Cleveland and Cleveland's a Plum. You can also purchase general admission tickets for $150 each. Remember, every dollar donated to the Cleveland Foodbank allows them to provide enough food for four nutritious meals in a local hunger center. I hope to see some of you at the event on September 10th. Come say "hi" as we nosh on delicious food! Happy Friday, everyone. For most of us, this weekend is also a long weekend. Bonus! What fun plans do you have? "R" and I are headed to Oktoberfest at the Berea Fairgrounds with friends tomorrow. Beer, food, people-watching, and wiener dog races. We went last year for the first time, and it was fun. We have no other plans for the holiday weekend, and that's really exciting. I love impromptu fun and excursions. For the past several weekends, our excursions have brought us some locally sourced goods. One stop included Szalay's Farm in the Cuyahoga Valley. Typically, we stop out there in the fall for pumpkins and their corn maze. I don't know why we've never been during the summer. They had all kinds of great produce, including fresh-picked corn. I just love summer corn on the cob. They also have a nice variety of canned and dry goods. We picked up some cherry preserves to serve on our "cheese nights" at home. We also got some pickling cucumbers and a spice packet, and have been enjoying sweet and spicy pickled vegetables this week. Saturdays also bring the North Union Farmers Market in Shaker Square, highlighting the local foods of Northeast Ohio. We've never been, but I've always wanted to go. Have you? I hear that it's one of the best farmers markets in our area. Luckily, we do have many options. So, I encourage you to take some time this holiday weekend to support local and pick up some of Ohio's great produce and other goods before summer is over. Any other spots that you'd like to share? How have I not written about one of my favorite lunch spots--Nate's Deli? Only open from 10AM-5PM on Monday through Friday, and 10AM-4PM on Saturdays, I often crave their food for dinner but can't get it. So I make a point to suggest it when meeting up with friends for lunch. It's just down the block from the West Side Market, and there is plenty of free parking behind the building. They offer a back door entrance--just don't be alarmed when you walk right through the kitchen. It is a relatively small place, and it's CASH ONLY so beware. But the service is quick, food is generally delicious, and I just love it. I tend to always get the same thing--a Fatoosh Salad and Shawarma Roll. This particular salad last week wasn't the freshest. It had that distinct "day old, I've been wilting in your refrigerator" taste, but this is the first time that has happened. It has great texture with crisp vegetables and crunchy pita chips, and it can be enough to share if you're ordering other things. The only menu item I've had that I don't care for is the Grape Leaves. Probably some of the worst that I've had. But, I also enjoy their hummus and falafel. If you're looking for a quick and delicious lunch stop in Ohio City, then this is your place. Its diner atmosphere, speedy service, and reasonable prices (Dining Deals Alert!) make it a great option. I've got a tasty lunchtime treat for you on this rainy, dreary Monday in Cleveland...it's a ticket giveaway for the Cleveland Foodbank's Taste of the Browns event on Monday, September 10th! The event is hosted at Browns Stadium, with about 20 of Cleveland's top restaurants serving up delicious samples of their signature dishes. While at the event, you get to meet and mingle with Cleveland Browns alumni and current players, sip on wine, beer, and signature cocktails, and bid on some exclusive auction and raffle prizes. All for a good cause, because for every $1 donated to the Cleveland Foodbank, it allows them to provide four nutritious meals in a local hunger center. Your $150 ticket never went to a better cause, because hunger is something that no one should have to experience. Food is such a basic need, and one that most of us take for granted. A little something for everyone, and some decadent desserts as well. My mouth is watering. 1. Leave a comment on this post, telling me which dish on the list above sounds the most tantalizing. 2. Tweet- "I want to attend the #TasteoftheBrowns thanks to @BiteBuff's giveaway at http://tinyurl.com/93wr7xr." Make sure you leave a second comment on this post, letting me know that you tweeted. You may tweet once a day to earn more chances to win. I will select a winner using random.org on Friday, August 31st. Good luck! Disclosure: I was provided with two general admission tickets to give away to one lucky reader, and two VIP passes to attend the event myself. I am a former employee of the Cleveland Foodbank, and used to plan Taste of the Browns for them. The opinions stated above are 100% my own. This event is truly awesome, and I will always support the important work that the Foodbank does in our community. Thank you to everyone that entered my Chefs Unbridled ticket giveaway this week. Drum roll please...random.org selected lucky #31- 6502Programmer. Please email me by Monday to claim your prize, or I will select another winner. 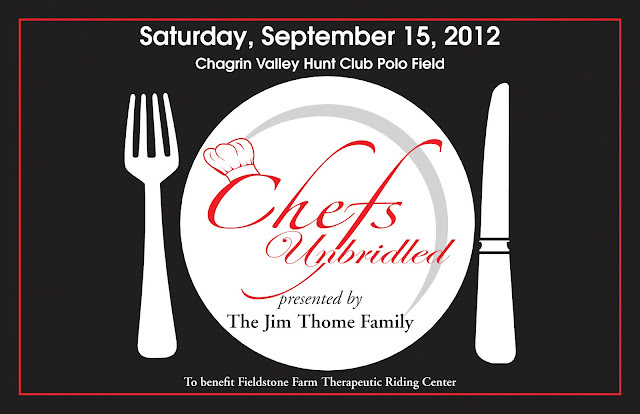 Include your contact information so that I can pass it on to the organizers of Chefs Unbridled. Tickets are still on sale, if you didn't win. Now, on to today's post. It is almost Browns regular season. How did that happen? I know that it is right around the corner, because "R" has been rattling on about the home opener tailgating menu for weeks. He takes his tailgating food very seriously. Because isn't fun and delicious game day food half of the experience? Well, Browns Stadium thinks so. That's why the Cleveland Browns Hospitality Group partnered with three of our area's top chefs to provide game day goodies like no other stadium offers. New dining options from Michael Symon, Jonathon Sawyer, and Rocco Whalen are available for all club and luxury levels ticket holders this season. As part of a tasting preview for club level ticket holders last week, a few of us (bloggers and traditional media representatives) were invited to attend and sample for ourselves. We tried a little bit of everything. Sawyer's Street Frites will offer menu items such as several kinds of frites (I suggest the Carbonara or Gravy), fish and chips, polish boy, brisket, spiced peanuts, and Danko's Donuts. Rocco has taken his popular Rosie & Rocco's concept from the casino, and will be serving lovely salads, a variety of meatballs, and specialty pizzas. Now, Michael Symon wasn't at the event but his larger-than-life mural on the wall reminded you of who was behind the concept of the popular B-Spot. You may remember from a previous post, that I am not a fan of B-Spot. During multiple visits, I found the meat to be dry and under seasoned. Interesting toppings, but beyond that I wasn't impressed with his burgers. Well, the Fat Doug burger that we shared (topped with coleslaw, pastrami, Swiss, and mustard) actually had great flavor and I loved the meat for the first time. Of course, these chefs aren't going to be executing these menus every day at the stadium, so maybe this partnership with ARAMARK was a good thing for the B-Spot burger? Overall, we all really enjoyed the food and it was certainly leaps and bounds over anything else that I've ever tried at a stadium. The prices are pretty reasonable too, compared to other stadium fare. So, if you are a club or luxury level ticket holder this season...you're in for a treat! These dining options are also available for special events and catering. Browns Stadium is on the cutting edge of stadium food, which is exciting and something to be proud of. It certainly heightened the anticipation of the home opener for me! Stay tuned for another Browns-related post coming up on Monday (hint, hint-- it's a giveaway for one of my favorite events). Happy Friday, folks! Disclosure: I was invited by the Cleveland Browns Hospitality Group to join them for a club tasting, and was provided with some delicious food and Browns swag. The opinions stated above are 100% my own. Go Browns! I first visited Chef Sawyer's downtown Noodlecat during a CLEDinnerClub event a few months ago, but Sunday led "R" and I there for some takeout on our way home from running errands. Little did I know, it was Happy Hour. Noodlecat offers Happy Hour from 3PM-7PM Monday through Saturday, but on Sunday it is available from 11AM-11PM. This means $5 half portions of noodles, $2 steam buns, and an array of drink specials. So, for just $21 we walked away with two orders of noodles, two steam buns, one beer, and tax/tip. We noshed on the steam buns, and Rick enjoyed a beer, while we waited for the noodles to go. For $2 each, we shared the BBQ Pulled Pork with pickled onions, slaw, and scallions. We also split the Japanese Fried Chicken with buttermilk crunchies and Iceberg. I enjoyed the fried chicken steam bun more. The pork was a little dry, and the flavor of the meat seasoning wasn't anything special. I wouldn't get that one again. Both buns were enough for us to each have about two good bites. I do wish the bun itself had been a little warmer. But, the real star of Noodlecat is the noodles. After having some amazing udon at the dinner event, I couldn't wait to have more. The Happy Hour special is for a half portion, and I ordered the Hokkaido Ramen with roasted pork, butter, chili oil, and creamed corn in a miso corn broth. "R" had the Crispy Beef Short Rib Ramen with kim chee pork broth, super dashi, and sweet sour short ribs. A half portion, in addition to our bites of steam buns, was enough food for dinner and just $5 (Dining Deals Alert!). I liked the milder flavor of my broth better, but "R's" dish had more contents. The pork was barely there in my ramen. I know that people have complained about the price point. Personally, I think $11 for a full portion of noodles is reasonable. The ingredients are quality (the noodles are made by local Ohio City Pasta--yum), and the regular size is worth that, in my opinion. But, if the price still turns you off--then I suggest checking out their Happy Hour. I thought it was a good deal, and love that Sunday offers 12 hours of specials. I look forward to getting my "slurp" on again. Cleveland's famous West Side Market celebrates 100 Years this year, and the year-long celebration is coming to a close with the Centennial Gala on Saturday, November 3rd. I've bit my tongue at responding to the outrage and negativity that exploded on Twitter and Facebook when the $250 Sous Chef (general admission) tickets went on sale last week. Many people stood up for the event, citing that it is a fundraiser for the West Side Market and the list of local and national chefs is outstanding. However, the bad outweighed the good (at least in my feeds). While I understand that this price-point is out of many people's budgets, I do not think that it justifies the outpouring of negative comments through social media. Yes, it is a HEFTY price to pay for an event ticket for many of us. Yes, the information about exactly what portion of ticket sales or where the money is going has not been fully disclosed. Yes, many great chefs that support the West Side Market on a weekly basis are not included in the lineup of participating chefs. But, does any of this really justify the things that I saw online from some people? No. As someone that works in the local event industry...I can tell you that $250 a ticket (or more) is not unheard of. In fact, it is quite common for a fundraiser. I just volunteered at a charity event on Saturday night that was $250 a ticket at a prestigious golf club with wine tastings and upscale catered food from just the in-house chef. Certainly nothing compared to a once in a lifetime event, like the Centennial Gala! The $250 ticket includes valet parking, tasting of chef's signature dishes, open bar, and a commemorative gift from Great Lakes Brewing Company. Personally, I am looking forward to a fancy night at the West Side Market celebrating its history and sampling food from some fabulous chefs. Would I have liked to see more representation of our local culinary scene? Sure. Do I understand that many of you may not be able to attend because of the ticket price? Yes, I get it. I think that you should focus on the events that you can attend, and support celebrating the WSM. There is something for everyone. We should all be rejoicing in the fact that we have something like the West Side Market, and that it is still alive and well after 100 years. Cleveland is lucky. The West Side Market is Cleveland’s historic public market and home to more than 100 diverse vendors offering fine meats and seafood, fresh fruits and vegetables, baked goods, dairy and cheese products, fresh flowers, ready-to-eat foods, herbs, candy and nuts. An estimated one million visitors from all over the world shop the Market every year, drawn by television programs that feature the West Side Market on the Travel Channel and Food Network. The West Side Market’s beginnings date back to 1840 and were commissioned by the City of Cleveland. The current building took 14 years to build at a cost of $734,890.72. Whether for first-time shoppers or regular customers, the West Side Market remains a treasured tradition in Cleveland and continues to offer an authentic and culturally diverse shopping experience where many stalls have remained under individual family control for much of the life of the Market — in a few cases dating back to its 1912 opening. Today, the Market is owned and operated by the City of Cleveland. So, "R" and I purchased our tickets to the gala this morning (now the website says "Sold Out" again) and I personally can't wait to attend. I know that many will not be able to come, but I hope that you consider splurging for this event or attending the free Street Festival and Parade on October 7th to help support the WSM. If you need me, we'll be holed up in the house saving up to pay off the credit card purchase...but I do think (and hope) that it will be worth it. UPDATE--- This afternoon, they announced that they will be adding a "People's Party" at Crop Bistro on Friday, November 2nd from 9PM - 2AM for just $25. Approximately 1,000 tickets will be sold, and any local chef can participate that is interested in contributing. It will feature informal potluck-style food, live music, cash bar, and auction. Tickets will be available at Cleveland Food Rocks, but they haven't gone on sale yet. So...now everyone really can afford to support the West Side Market. A free festival and parade, a $25 party, and $250 gala. Pick your poison. Hope to see all of Cleveland out celebrating! In case you aren’t familiar, Fieldstone Farm Therapeutic Riding Center (located in Bainbridge) is one of the largest therapeutic riding centers in the country, serving about 800 students annually (from preschoolers to veterans). Through a special partnership with horses, Fieldstone offers programs designed by professionals to foster personal growth and individual achievement for people with disabilities. 1. Leave a comment on this post, telling me which chef you'd look forward to trying. Personally, I'd like to sample food from Matt Mytro at Flour. I haven't had his food in years. 2. Tweet "I want to attend Chefs Unbridled to benefit #FFTRC thanks to @BiteBuff at http://tinyurl.com/d7tentm". Make sure that you leave a second comment on this post to let me know that you tweeted. You can tweet once a day from now until Friday, August 24th. I will select a winner using random.org on Friday. Good luck! Disclosure: I was offered two tickets to use as a giveaway, and two tickets to attend the event. Unfortunately, I will be unable to attend because "R's" mom is getting married that day! The opinions stated are 100% my own. Bratenahl's Americano is tucked away in the One Bratenahl Place residential tower, with a guarded gate and gorgeous views of the lake and downtown Cleveland. Many may not even know that this restaurant exists, and is open to the public. I became aware of them through the food events that I plan for area non-profits, but hadn't been there to dine...yet. At a charity event last September, I won a gift card to Americano in a dining basket that I bid on. So, I was more than ready to check them out first-hand on Saturday night. We met two other friends there, and were seated right away for our 7:30PM reservation. We settled in with bread and drinks, and started to look at the menu. It was difficult for all of us to choose. I always take that as a good sign. "R" and I decided to share the Fresh Sweet Corn and Ricotta Ravioli with spinach and mushrooms in a light cream sauce ($10). Please note that this is only a half portion shown above. They knew we were sharing the dish, and split the plate with no extra charge. There was a lot of filling in the ravioli, and the light cream sauce and sweetness of the corn complimented the smooth ricotta well. It was good, but I think more spinach and mushrooms would have given the dish more depth in flavor. I ordered a scallop special, that included a corn polenta, diced vegetables and chickpeas, slaw, and a zesty pesto drizzled around the edge of the plate. For $27, I thought that four large scallops and the amount of polenta and vegetables was a very fair price. Overall, I loved the flavor and textures in this dish-- particularly the pesto and sweet Ohio corn. However, the addition of the chickpeas started to bother me about halfway through the dish. It was an odd texture for this type of dish, and a little heavy-handed in quantity. We all seemed to really enjoy our entrees (salmon, mac and cheese, and steak), and a sweet treat of their Lava Cake with Vanilla Ice Cream helped finish off the meal. Overall, the food was very good in my opinion. However, our service was not. At least the bread supply was kept up, and our water glasses were never empty very long. But for our second round of drinks, I actually had to call out to our server as she scanned our table and then kept on walking past. She was quite absent throughout the meal, and at one point two other servers were taking orders and helping our table. It became confusing, and somehow we were still neglected with three people chipping in. A busy night is not the excuse here, because while there were several other diners-- the restaurant was never at full capacity while we were there. It was odd. "R" actually labeled it the worst service he's ever experienced. At least the good company and good food kept me distracted most of the time! Also, I appreciated that host and co-owner, Cole, did stop by our table a few times to check in on us. This was prior to long lags in service, or we would have mentioned it. Would I go again? I think so. The food is all that matters at the end of the day, and it was very good. Last week brought a couple of new dining finds to me. The first, was a lunch meeting at Carnegie Kitchen in downtown Cleveland. Located just up the street a bit from Progressive Field, they offer their own parking lot and easy access to this breakfast/lunch spot. The lunch menu offers soups, salads, wraps, sandwiches, a few other small plate items, and omelets all day long. After a little poking around online, I saw a review that said the Tuna Salad Wrap with olives, lettuce, tomato, and feta cheese ($7.25) was tasty. Dining Deals Alert! This picture only shows a half portion, and it doesn't do the size of the wrap justice. It was easy to manage and didn't fall apart, and provided me with two meals. Everything tasted fresh, and I loved the addition of olives and feta to a classic tuna salad. It wasn't anything special overall, but it certainly did the trick and I walked away satisfied with my lunch. The space is large and open, with minimal decor or atmosphere. But with decent lunch fare and private free parking-- this is a good spot to meet for a business lunch, and one that I will keep in mind. Last Thursday brought us a fun dining excursion...all-you-can-eat crab legs at Lure Bistro in Willoughby. Known for their sushi (half-off on Tuesdays), they are running this Thursday special right now and we couldn't wait to dive into some crab legs. For just $28.50, it's one of the best deals that I've seen on AYCE crab. The meal also included a side salad, which was doused a little too much in the dressing for my taste-- but otherwise very good. Fresh bread arrived with the salads, and it included a mango butter. I was quickly distracted by the crab when it arrived shortly after, but I didn't taste the mango flavor in it. With the main event, french fries and coleslaw are served. But those were easily ignored for the most part. Bring on more crab! They were flavorful, easy to crack, and had large pieces of meat in them. Very much worth the work, and the coating of crab smell on our skin at the end of the night. I do want to head back to Lure for sushi some night. The menu is lengthy, and so many of them were unusual and tempting. I have heard that the quality of the sushi isn't as good as it was a few years ago. The chef left to open his own place. But I still want to try it for myself. Several of the starters also sounded great, like Tuna Nachos, Shrimp Ceviche Tacos, and Seared Ahi Tuna. Our server did tell us that the nachos are his favorite thing on the menu. We were seated on the spacious patio/outdoor bar area, and it was very casual and almost tropical feeling. Inside, it was a little more formal and had a gorgeous fish tank behind the bar. I do have to note that our server was fantastic, and kept the crab legs coming for us. But I did overhear a manager instructing another server to "get them their check and get 'em out of here", and we were told that we only had our table for a limited window because of other reservations for crab night. They are certainly in the business of getting you in and out on Thursdays. Which I can see why, because they were packed by the time we left at 7:00. You should definitely call for a reservation. Free valet service is provided out front, which was appreciated because street parking can be difficult in downtown Willoughby. So, there you have it folks. A fun night out cracking some crab. I suggest getting out there yourselves! I know that there is still one day left this weekend, but we have packed enough fun into the last two days that I am ready to call it quits. The summer events in Cleveland just don't stop, and we've been spreading ourselves pretty thin the last several weeks. But I just can't say no to some of my favorite events, and some new finds as well. Friday night, "R" and I attended our fourth Twilight at the Zoo. As usual, the event was sold out and thousands enjoyed live music from 18 bands, buffet food, all-you-can-drink beer and wine, and exploring the zoo grounds. It's always fun to see the animals out and about as the event gets started. We had a blast, and I already can't wait for next year. I always run into people I know at this event, and the evening traditionally ends with me dancing in the grass with quite a buzz and my shoes off. 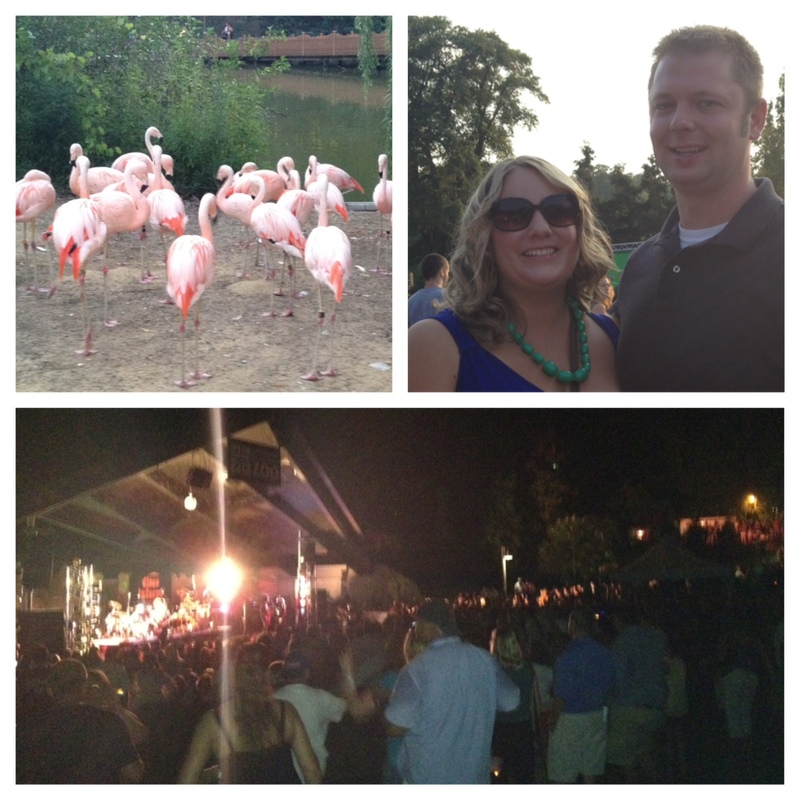 The zoo sure knows how to throw a good party! Our weekend fun didn't stop there. 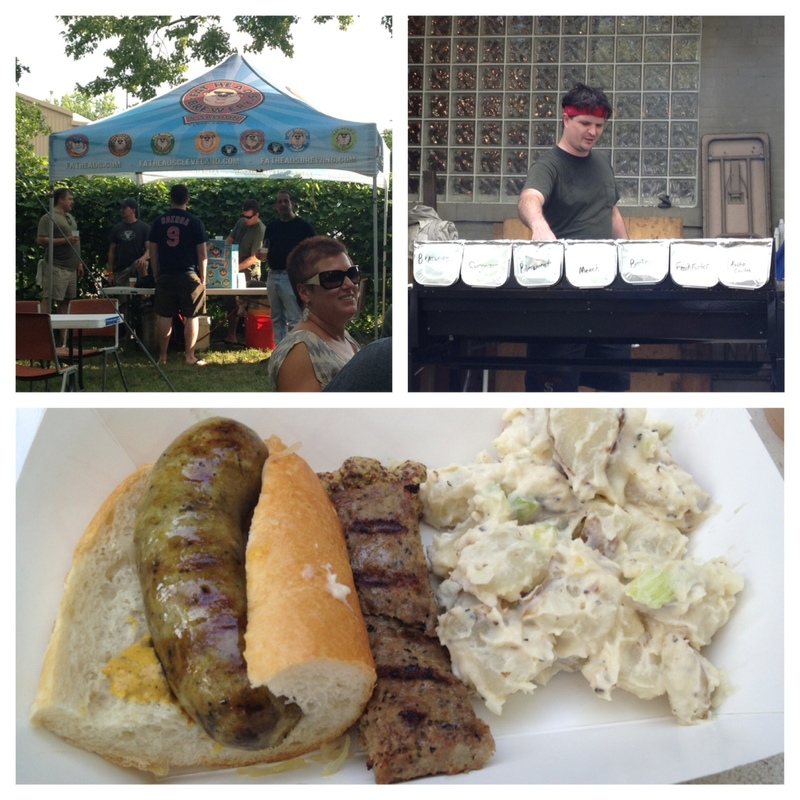 Saturday brought the Sausage Fest at Sachsenheim Hall. 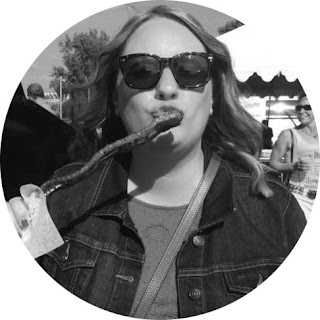 In my original blog post, I had promised you yummy sausage, all-you-can-drink beer from four local breweries, and great people watching. I'm happy to say that the event delivered all of that, and so much more. It lived up to my expectations, and I'd go next year in a heartbeat. Today brings errands, organizing a storage unit, and drafting our wills...the fun is over. What did you do this weekend? Krusty's Summer Sauce Camp, Vintage Ohio Wine Festival? The options were endless. On Monday afternoon, KJ Greens came to my rescue. KJ Greens is a small specialty produce farm, located on 30 acres in Andover, Ohio. They offer over 30 varieties of micro greens, 25 types of heirloom tomatoes, and an array of baby and standard sized fruits, vegetables, and herbs. They supple many of our area's restaurants, and often contribute product for events like Dinner in the Dark. Back in June, they hosted a Twitter giveaway, and I was randomly selected as a lucky winner of one Harvest Basket full of Ohio produce. "R" and I have both been traveling a lot the last two months, for work and play, so I held off on the delivery of my prize. Finally, we were both back home with nothing else on the horizon, so I contacted them on Sunday to see if we could get the basket delivered soon. Monday afternoon--it arrived bursting with goodies! A huge bag of lettuce for salads, peaches, heirloom tomatoes, corn, onions, red okra, squash, three kinds of shoots for garnish, and radishes. I was so excited, and couldn't wait to play in the kitchen (with "R" doing most of the work, as we all know). Now, when I said that KJ Greens came to the rescue--I meant it. We had just gotten back from NY the night before, and our refrigerator was EMPTY. We took a look at what we had in the box, added a couple of items...and we made an awesome stirfry that came out even better than we had hoped! We quartered the scallop squash, cut up the red onion, and mixed in some fresh mushrooms and spinach that we happen to have hidden in the fridge. We threw that all on the grill in our handy basket. Next? We grilled some of the corn and peaches to mix in later. I absolutely love grilled corn on the cob in the summer, and this corn was so sweet. Have you ever grilled fruit? We love doing peaches and pears. Finally, everything was cooked (including some shrimp on the grill) and we threw it all together on a plate. Added a drizzle of Thai yellow curry sauce, brown rice, and a popcorn shoot from KJ Greens, and we were all set for dinner. For an "empty" fridge and a box of Ohio produce-- I was pretty pleased with what we came up with! I know that some of you are doing Fresh Fork, or another CSA this summer. Are you loving it? Also, our area has some great farmer's markets every week. Click here for a list of markets in Cuyahoga County this summer. Get out there and try some Ohio produce and other local goods! This is the best season for it. Disclosure: I entered a free giveaway on Twitter, hosted by KJ Greens (@kjgreens), and was randomly selected as the winner of one harvest box. The opinions stated are 100% my own, and the talent in the kitchen is 100% "R".